Bathrooms are among the most used rooms in any home, especially if you have a large household. Given the amount of time spent there, it makes sense that this space should be designed in a manner conducive to a daily routine. If you have a large family or too little space, you know how easily a bathroom vanity can get cluttered with grooming tools, hygiene products, and other sundries. Optimize the space you have available with a spacious-conscious bathroom remodeling in Feasterville, PA. Does your bathroom feel cramped? Are you constantly knocking beauty products and other items off of your vanity during your morning routine? Imagine how much simpler your routine could be without having to stop and tend to fallen items. With an optimal bathroom design, you can always start your day off on the right foot. Our team is equipped with the knowledge and skills to redesign your bathroom for comfort, style, and above all, functionality. Whether we’re removing walls and partitions for a new showering setup or renovating your bathroom vanity, we’re prepared to make your space easier to manage. Your bathroom is your private oasis, but it can hardly take you away to paradise if it’s seen better days. Have you grown tired of the uninspiring traditional look with simple tile bathroom flooring and an ordinary white bathtub and shower? When you turn our specialists for a custom shower design, we give your shower space a makeover that is sure to bring out its inner tranquility. Our knowledgeable team knows what it takes to create a vibrant, relaxing bathing space that flatters your home without compromising your renovation goals. When you visit our expansive showroom, you are free to take your pick of our stylish bathroom vanities, cabinetry, and shower and tub arrangements. When you put your needs in our hands, your options are nearly endless. When it comes to bathroom flooring, you need something that’s able to stand up to the demands of an active household. Depending on the size of your family and the number of bathrooms you have in your home, it may be one of the most used rooms of the house. 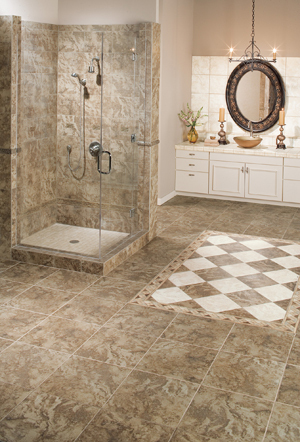 Effective bathroom flooring must withstand the foot traffic, moisture, humidity, and the inevitable messes that wind up there. Dirty children, wet pets, and sweaty adults can take a toll on your bathroom floors. When you want to revamp the look, feel, and functionality of your bathroom, our specialists are prepared to fit your space with flooring that can handle whatever is thrown its way. Simply share your design aspirations with our knowledgeable staff and we’ll help you create a bathroom design that’s as attractive as it is practical. Contact us to get your bathroom remodeling project started today. We proudly serve homeowners in Feasterville, Holland, Southampton, Warminster, and Willow Grove, Pennsylvania.